Slice of Pi Quilts: I Wish You a Merry QAL - A Finished Quilt! I Wish You a Merry QAL - A Finished Quilt! This quilt has been months in the making! 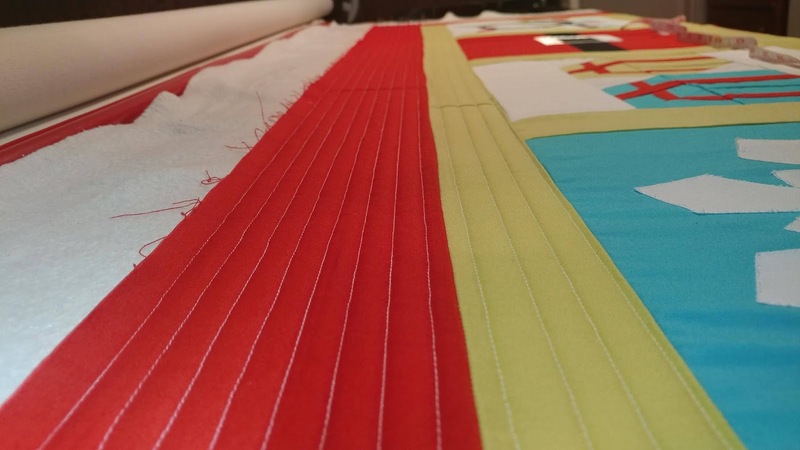 Clear back in June, April of JANDA Bend Quilts asked if any participants from this year's New Quilt Bloggers group would want to host a quilt along. The QAL started in August, and twelve quilt blocks later, my quilt is finished! 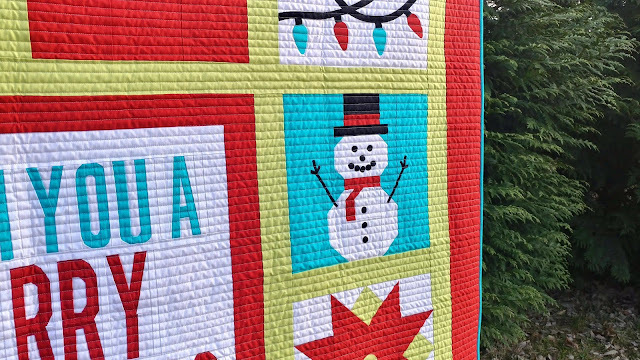 I'm so excited to share my version of the quilt with you! 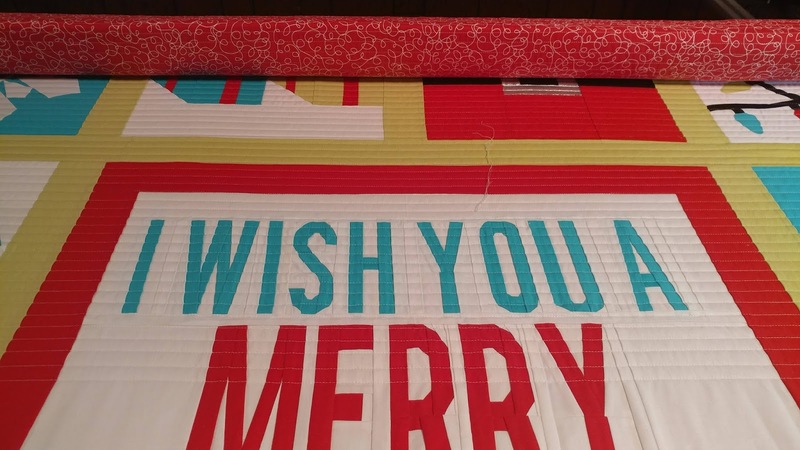 The "I Wish You a Merry Quilt-A-Long" has been such a great experience! 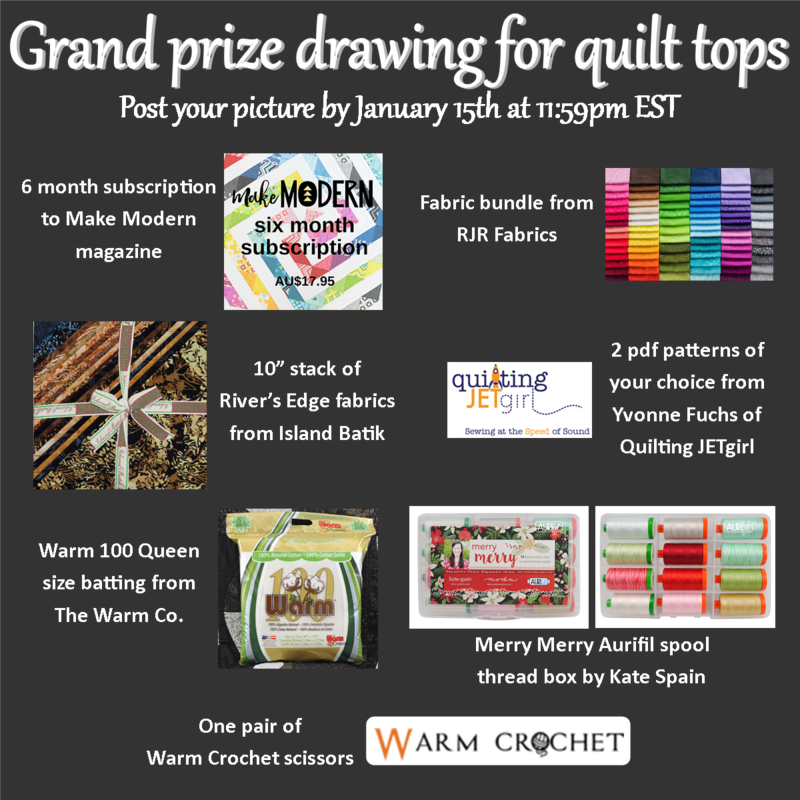 This was the first time I'd ever participated in a QAL! It was definitely a great opportunity to try new things and a way to challenge myself to make things outside of my usual style. All eleven designers each had different styles and used different techniques in their patterns. I decided to use a limited color palette in order to tie all the blocks together. I primarily used Kona Lipstick, Kona Breakers, Kona Cactus, and Moda Bella 98 White. I also used a bit of Kona Black, Kona Chocolate, and silver lame fabric. 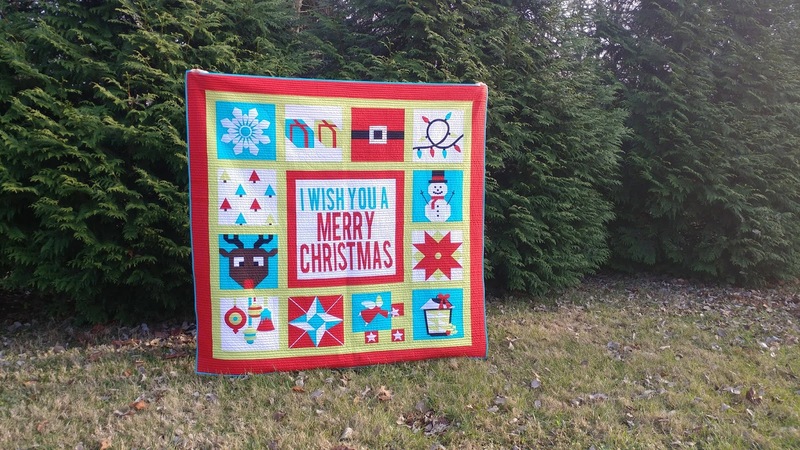 I used 50wt Aurifil thread for all the piecing and applique. 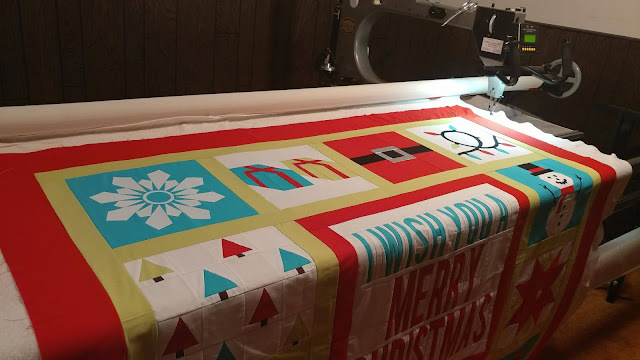 For most of the piecing, I used Aurifil #2324 Stone - it's a great neutral for any color of fabric. For applique, I used #2250 Red, #5017 Shining Green, #1148 Light Jade, #2024 White, and #2692 Black. You can get more details on each version of my blocks on their individual posts (I link to each of the patterns on those posts too). 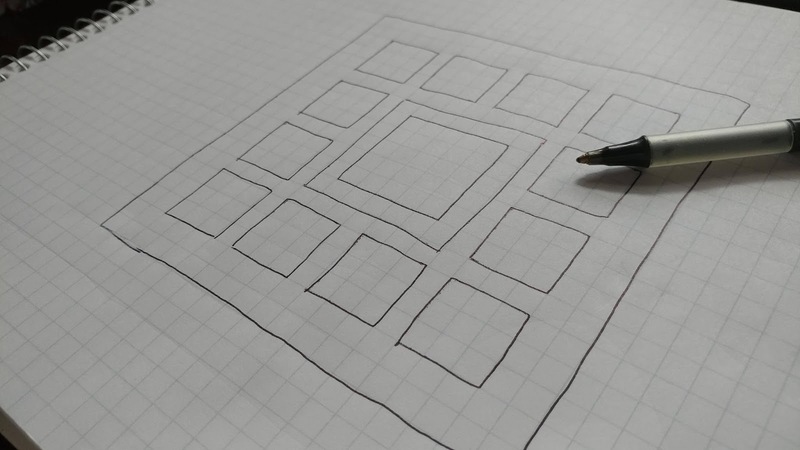 Once all twelve blocks were completed, I used graph paper to test out different arrangements of the blocks. I decided I wanted to arrange them around a center focal block. The graph paper allowed me to decide on sashing size and a border too. The center block would need to be 22 1/2" square (unfinished), then I would frame it with a 2" border to make it 26 1/2" total. For my center block, I wanted to paper piece "I wish you a Merry Christmas" as a nod to the name of the QAL. I could have appliqued the letters (which would likely have been much faster too! ), but I like to paper piece, so decided to go that route. If you like the layout of the large center block, you could get the same look by using a pre-printed Christmas panel (cut to 22 1/2" square if using a 2" border around it, or 26 1/2" square without adding the border) or creating a unique focal block (like an appliqued nativity scene). 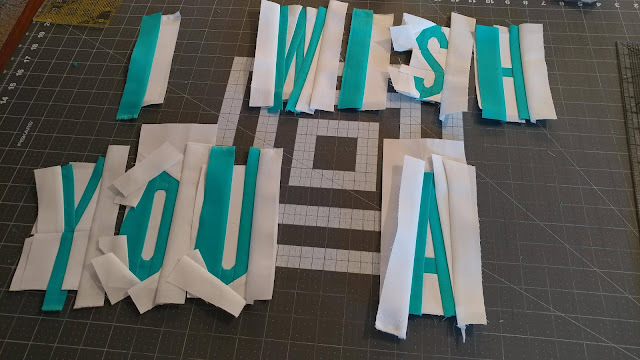 For my paper pieced block, I started with the letter pattern found here (I've used this pattern several times!). However, I resized and stretched the letters so they would fit in the 22 1/2" center square a little better. 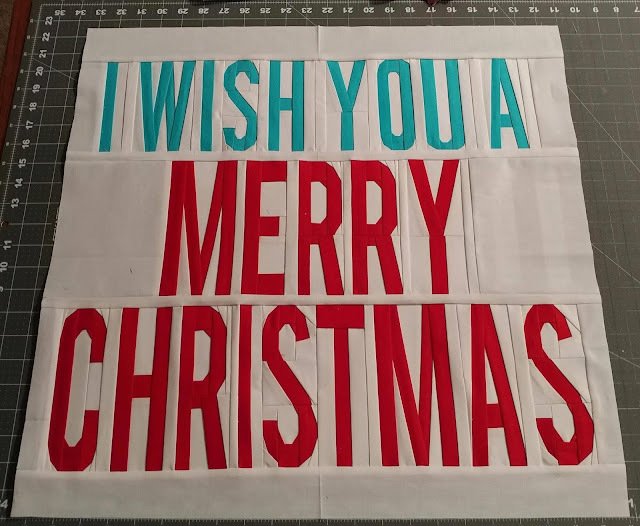 The "I wish you a" letters finished at 4 1/2" tall, and the "Merry Christmas" letters finished at 6" tall. 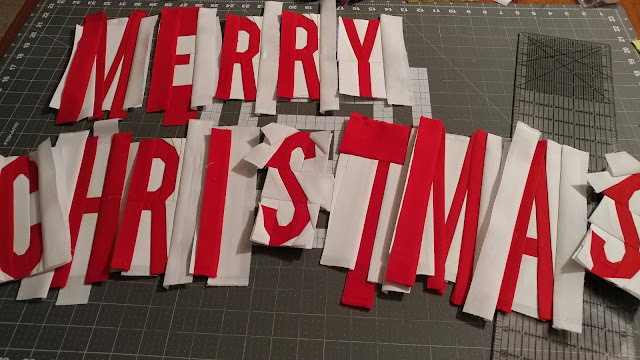 The stretching of the letters did create a few snafus. This is especially noticeable on the "S" letters. I decided I could live with it though, so I left them. Just proof that it's homemade! 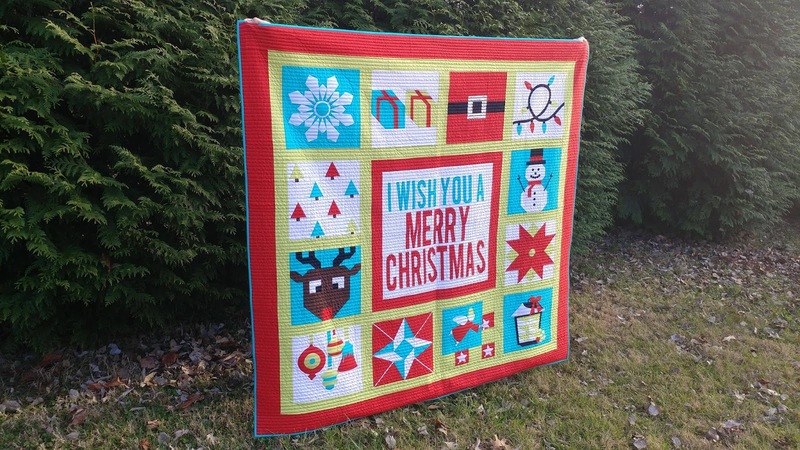 I was quite indecisive about how to quilt it (imagine!). I was at my mom's for Thanksgiving, and she has a Gammill longarm, so I wanted to take advantage of that! I decided to do something "easy" and quilt straight horizontal lines 1/2" apart using white thread. That "easy" design did have a few hiccups (boy am I glad I follow a few longarmers on Instagram!). I learned why longarmers will sometimes add batting scraps as they roll the quilt (to help keep the quilt straight if it rolls a little wonky), and I learned a few tricks for easing fabric in as you quilt to keep things straight too. I am really happy with how the quilt turned out! 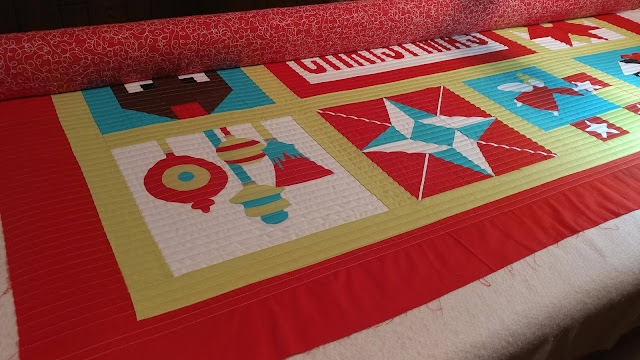 The straight line quilting was a great decision. 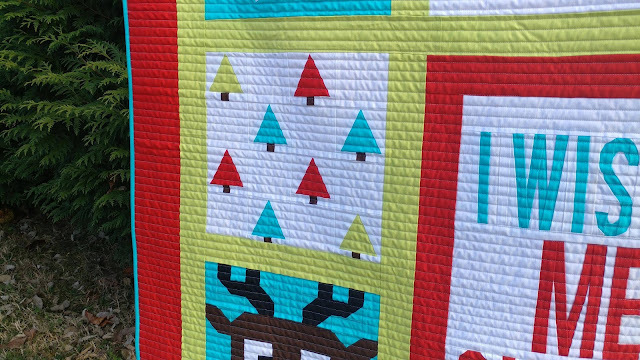 It fits very well with the "modern" vibe of the quilt, but also doesn't take away from any of the block designs. I chose a red 108" wide backing fabric called "Bungle Jungle" by Moda from one of my mom's local quilt shops. I thought the design looked a bit like tangled Christmas light cords! Once quilted, I used 2 1/4" double fold binding to bind the quilt (machine stitched, like always). I cut the strips straight of grain from a 1/2 yard of Kona Breakers. I thoroughly enjoyed the "I Wish You a Merry QAL!" If you have too (or want to try one out! 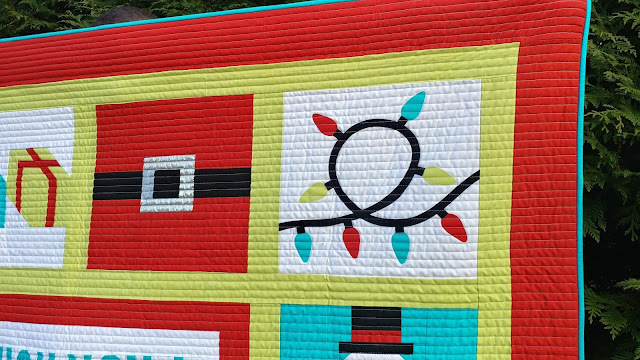 ), there's going to be a fall-themed quilt along in 2018 too! Be sure to join the current Facebook group so you'll be the first to know the details! 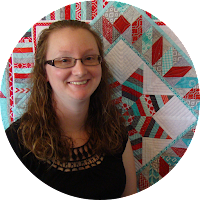 Be sure to hop over to all the other hosts' blogs to see their quilts! They are all so unique! 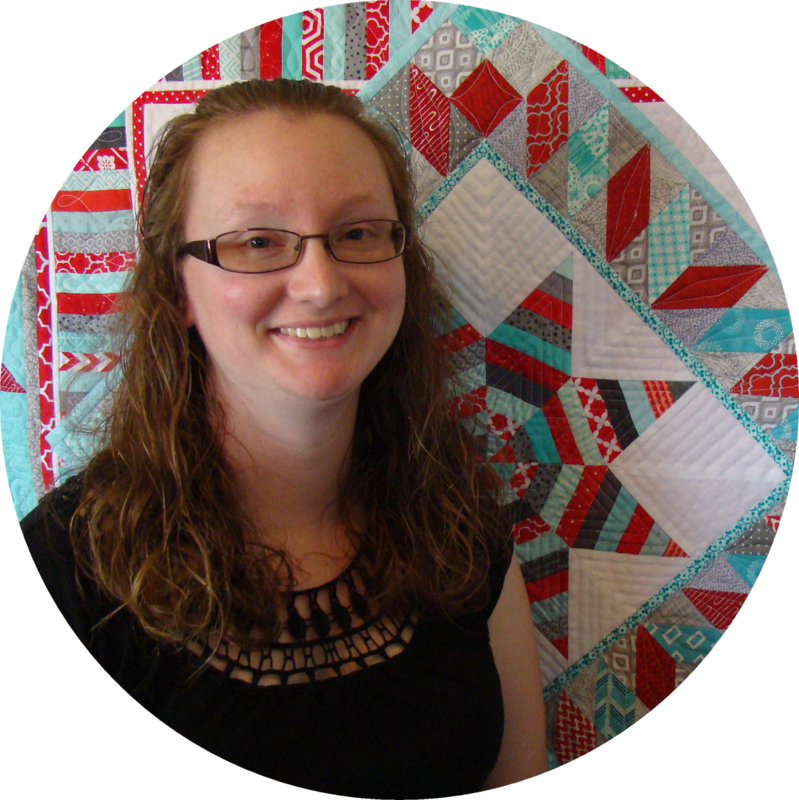 Laura at Slice of Pi Quilts <---- That's me! The grand prize includes: a six-month subscription to Make Modern magazine, a fat quarter bundle of Hopscotch fabrics from RJR Fabrics, a 10" stack of River's Edge fabrics from Island Batik, two pdf patterns of your choice from Yvonne Fuchs of Quilting JETgirl, a Warm 100 queen-sized batting from The Warm Co., a Merry Merry thread box by Kate Spain from Aurifil threads, and a pair of Warm Crochet scissors! 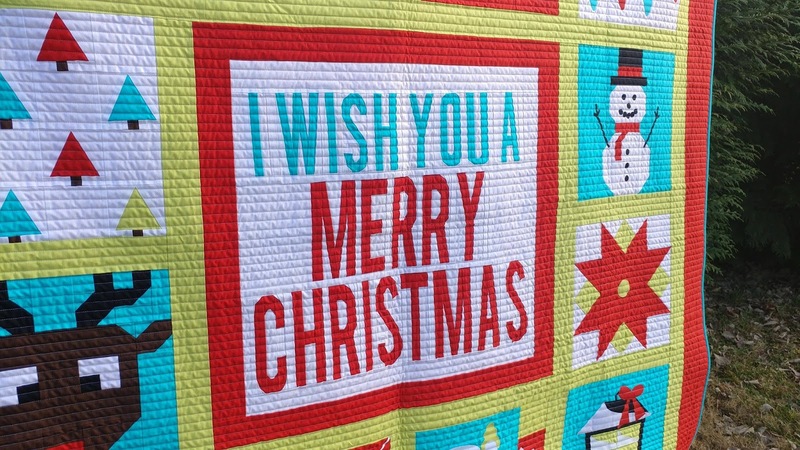 Be sure to share a picture of your "I Wish You a Merry QAL" Christmas quilt top before 11:59pm on January 15th to be entered to win the grand prize! You can post a picture in the Facebook group, on Instagram using #iwishyouamerryqal, or link up to the linky party at the bottom of this post! Remember, all prizes for the QAL are open to participants worldwide! Join the fun! 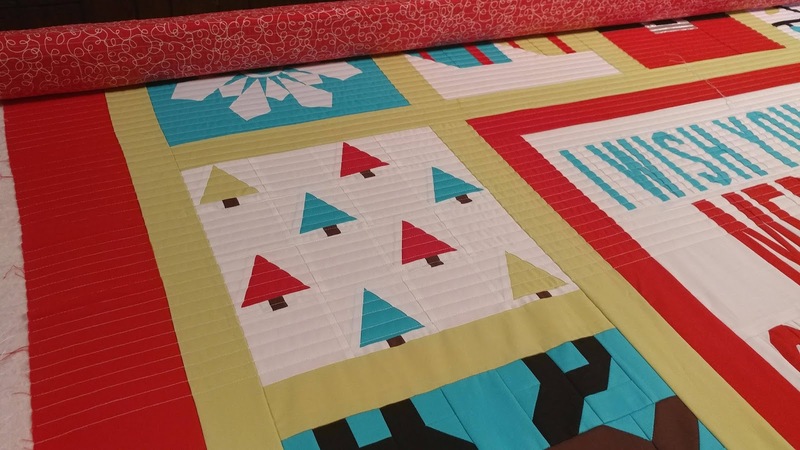 Let's quilt along! Linking up with Main Crush Monday at Cooking Up Quilts, Monday Making at Love Laugh Quilt, Linky Tuesday at Freemotion by the River, Let's Bee Social at Sew Fresh Quilts, Wednesday Wait Loss at The Inquiring Quilter, Midweek Makers at Quilt Fabrication, Needle and Thread Thursday at My Quilt Infatuation, Finish It Up Friday at Crazy Mom Quilts, Finished or Not Friday at Busy Hands Quilts, Can I Get a Whoop Whoop at Confessions of a Fabric Addict, and TGIFF at Devoted Quilter. I haven't joined in this QAL, but I have really enjoyed following it and seeing the different variations everyone has made. 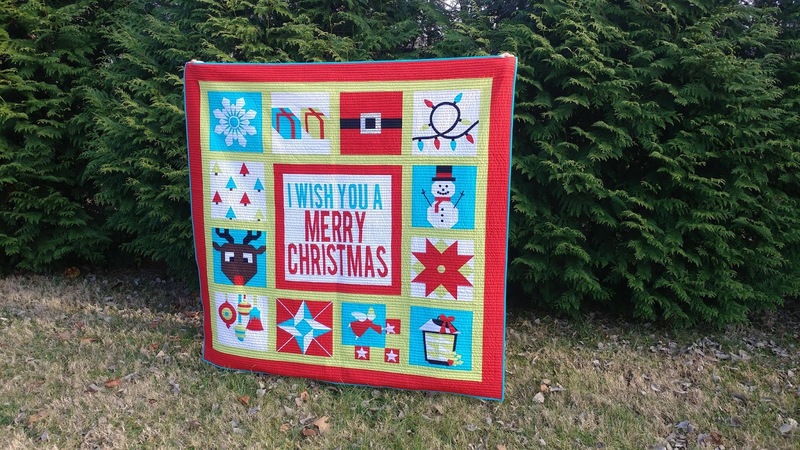 Your quilt is amazing, I really like the centre panel addition and modern quilting. Well done to you and your whole group. 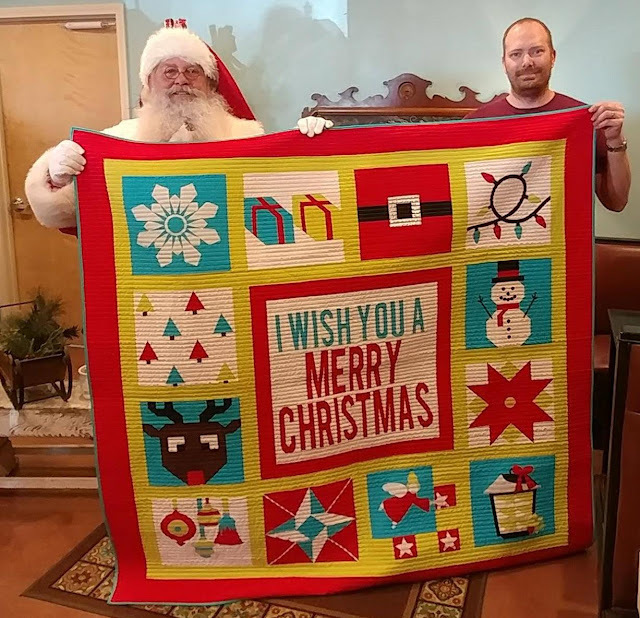 Great quilt a long! I'm not sure the link to the paper pieced letters is correct. I've searched the whole site and can't find it. Can you please check and see if I'm missing it somehow? Thanks. Thank you, Kim! I've corrected the link now! It is a pattern on Craftsy by "From Blank Pages." You are just amazingly quick! Love your finish. I had no idea you'd pieced those letters! 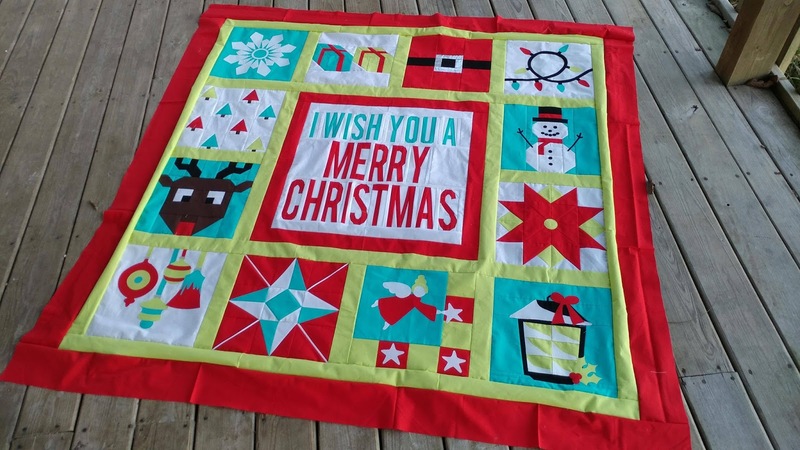 Amazing job on the quilt--the setting is perfect and the quilting is quick and fast and doesn't take away from the individual blocks. 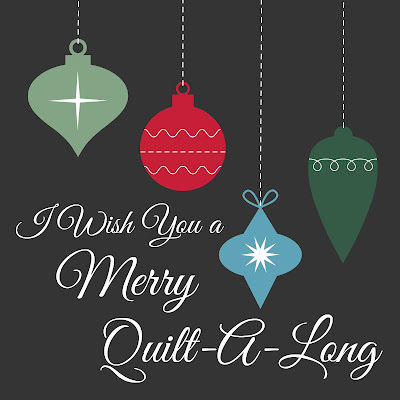 I haven't yet decided on my quilting plan, but I"ll keep this in mind! Thanks for linking up to Wednesday Wait Loss. Love your version - the message in the center is perfect! Thanks for sharing! Beautiful! I love your colors. 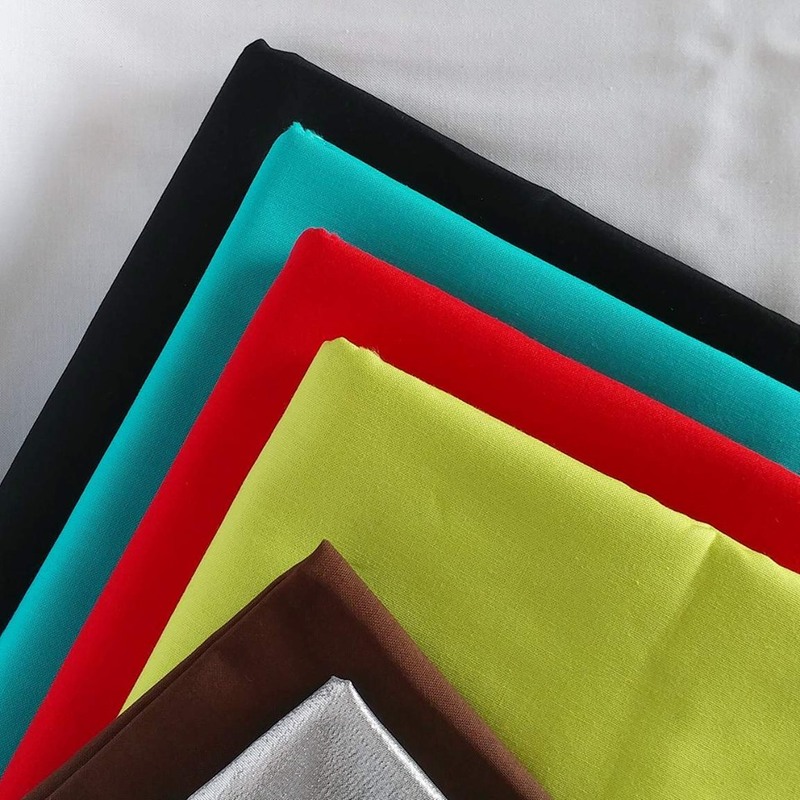 Your colors are terrific and that center panel is amazing. Great finish! Your quilt is really beautiful. I would not be able to choose a favorite block, they're all so cool. Thanks for sharing the link to the alphabet patterns. this is amazing!! !this is the first I've seen of it as I have been on a screen hiatus... Love it!! 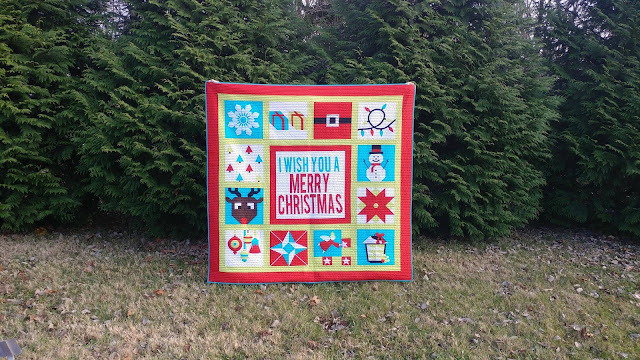 Lovely Christmas quilt! Your version is modern and fresh. Paying It Forward - Again!